I’d like to introduce Johnson’s Baby, a sponsor for BlogFest and Blogmania! Johnson’s Baby has been around for many generations. I can remember using their products with my girls and I know my mom used them as well with my sisters and I. Their baby products are clinically proven to be both mild and gentle. 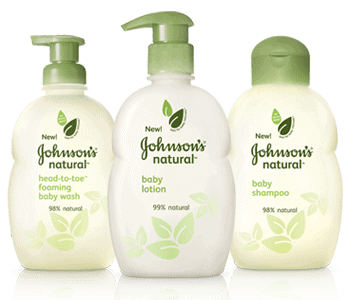 Johnson’s Baby has recently introduced a new line of baby products called Johnson’s Naturals. This line is formulated with 98% natural ingredients, their NO MORE TEARS formula, and ALLERFREE, an allergen-free fragrance that smells clean and natural. There’s no essential oils, parabens, or dyes and it’s dermatologist tested. They are event gentle enough to use on your newborn baby. Find Johnson’s Naturals at your local grocery store, drug store or mass market retailer. To coincide with the launch of the new line, JOHNSON’S® is introducing a new micro site, www.johnsonsnatural.com, where moms can get information about the products and ingredients, receive coupons and view a new video series. The video series entitled “Baby Steps to a Natural Lifestyle,” showcases real moms who offer tips on how to incorporate natural living into everyday family life affordably. The videos feature real-life moms including natural lifestyle expert and author Sara Snow, prominent mommy blogger and co-founder of Cool Mom Picks Kristen Chase, and Holly Ambrose, a mom blogger who regularly works with the National Wildlife Federation. Recognizing that part of living a natural life for moms includes the ability to introduce little ones to the great outdoors, JOHNSON’S® has teamed up with National Wildlife Federation in support of their efforts to inspire families to spend more time outdoors in nature. These Johnson’s Natural Baby Products are great, so gentle.